For quantitative determination of oxaloacetate and evaluation of drug effects on its metabolism. • Sensitive and accurate. 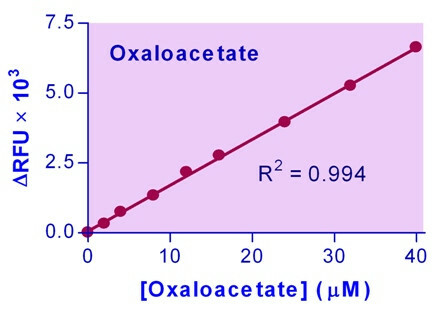 Linear detection range: 7 to 400 μM oxaloacetate for colorimetric assays and 1 to 40 μM for fluorimetric assays. Oxaloacetate (OAA) is an intermediate in the citric acid cycle and participates in gluconeogenesis. OAA is formed by the oxidation of malate, by deamidation of aspartate or by condensation of CO2 with pyruvate or phosphoenolpyruvate. 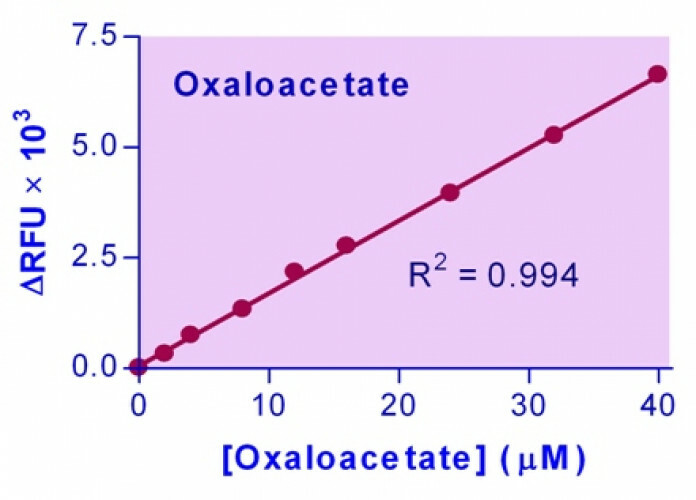 BioAssay Systems’ Oxaloacetate Assay Kit provides a simple, direct and automation-ready procedure for measuring oxaloacetate concentration. OAA is converted into pyruvate which is then oxidized with the conversion of the dye into a colored and fluorescent form. The color intensity of the oxidized dye at 570 nm or fluorescence intensity at λex/em = 530/585 nm is directly proportional to the oxaloacetate concentration in the sample. Applications For quantitative determination of oxaloacetate and evaluation of drug effects on its metabolism.